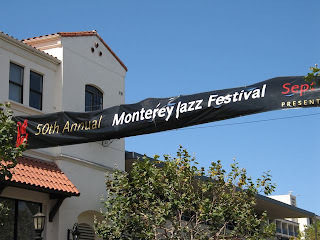 The Monterey Jazz Festival begins tomorrow. There are two levels of tickets: arena packages (which get you into everything including the big shows in the 7,000-seat equestrian arena) and grounds packages (everything but the arena). Arena packages have been sold out for weeks. Saturday and Sunday grounds tickets are also sold out. The lineup includes John McLaughlin, Dave Holland, Diana Krall, Los Lobos, Terence Blanchard, Ornette Coleman, Sonny Rollins, Dave Brubeck, Gerald Wilson, Joey De Francesco, Otis Taylor, Cyrus Chestnut, Craig Taborn, Sean Jones, and on and on. Clint Eastwood and John Sayles are scheduled to talk about jazz in the movies. We can pick up our press credentials starting at 10 a.m. After that, if time allows, we're off to Point Lobos. We spent today exploring Monterey proper and adjacent Pacific Grove: antiquarian bookstores, art galleries, shops. The people we met in Pacific Grove were friendly, warm, and chatty. The guidebooks say it's a place with a small-town feel, and it is, except even small houses are valued at $1 million. Dinner tonight at Fresh Cream. We'll be eating fair food for the next few days.